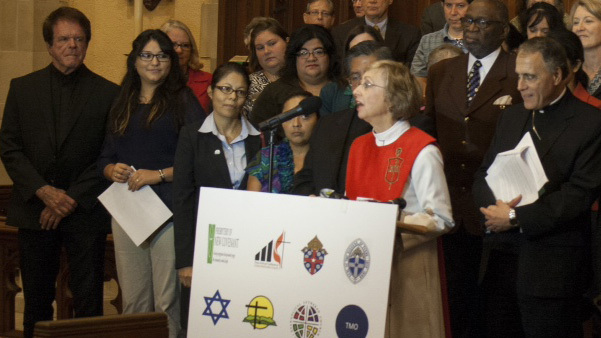 Methodist Bishop Janice Riggle and Catholic Cardinal Daniel Dinardo spoke at a TMO press conference supporting comprehensive immigration reform and condemning the “Safe Act” bill. With clergy and representation from every major religious denomination in Houston, leaders called on those who oppose the SAFE Act to communicate their perspective with the Congressional representatives. Bishop Michael Rinehart of the Evangelical Lutheran Church of America noted that the SAFE Act contradicts the immigration principles local religious leaders first put forth in 2008. Rev. John Ogletree of First Metropolitan Church and Rabbi David Lyon of Congregation Beth Israel also called on Congress to pass comprehensive immigration reform.